If you follow my Instagram stories you likely already know I’ve been tinkering with my How To Make Tofu Taste Good recipe to make the process even faster (20-25 minutes!). I thought it wasn’t possible to make crispy tofu without baking it for at least 30-40 minutes. But, I was wrong. One night when I was super hungry and desperate for dinner fast, I tried this new-and-improved method and it worked so well I’ve since used this one exclusively! It’s that good. I don’t know why I didn’t think of this sooner. Plus, it easily carves 5-10 minutes off of the original method and includes the opportunity to add more seasonings. Step 1: Preheat oven to 375 F (190 C) and wrap your extra firm tofu (this is important – anything less than extra firm won’t crisp up as fast or as well) and set something heavy on top like a cast iron skillet. Step 2: Cube tofu and add to a mixing bowl. Season with salt and, depending on what type of dish you’re adding it to, season accordingly (i.e. curry powder for a curry dish, or a bit of tamari and/or chili garlic sauce for a stir-fry). I was adding mine to a green curry (coming later this week! ), so I went with curry powder. Step 3: Sauté in oil over medium heat for about 5 minutes or until browned on all sides (shaking the pan as needed to cook all sides). Step 4: Finish baking in the oven for about 15 minutes or until crispy and golden brown. Mmmm, yes, please. Now what? Add it to salads, curries, stir-fries and more! While seasoned well on the outside it will still benefit from a hearty sauce, like my stir-fry glaze, Almond Butter Tofu Glaze, or a NEW green curry sauce coming soon! If you try this new-and-improved method, let us know! Leave a comment, rate it, and don’t forget to tag a photo #minimalistbaker on Instagram. Cheers, friends! The fastest, easiest way to make crispy tofu for any dish. Just 4 ingredients and 20 minutes required! Perfect for adding to stir fries, curries and more! Preheat oven to 375 degrees F (190 C) and wrap your extra firm tofu in an absorbent towel. Set something heavy on top - like a cast iron skillet - to press out extra moisture for 5 minutes. 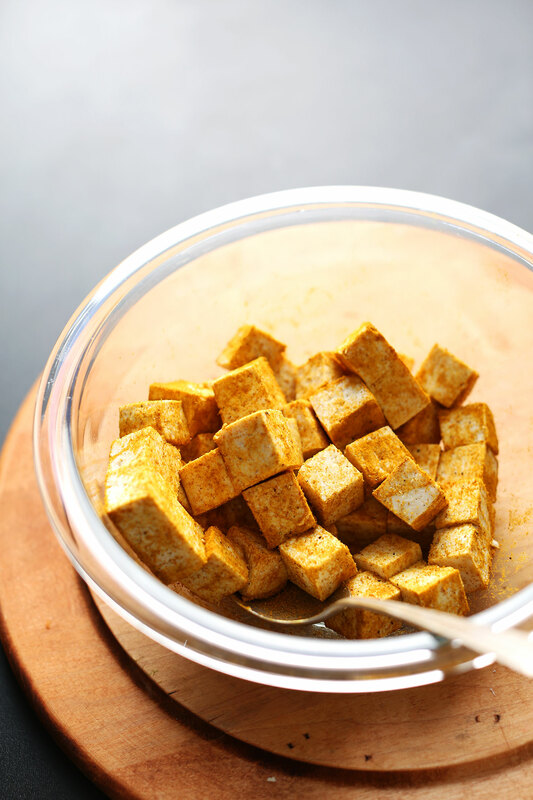 Unwrap tofu and cut into small cubes (see photo), then add to a medium mixing bowl and season with a pinch of salt and desired seasoning, which will vary depending on your dish. I was adding mine to a curry, so I added curry powder. If adding to a BBQ dish, try a BBQ seasoning blend. Or if adding to a Thai dish, try a Thai curry powder. If you want it to remain neutral in flavor and just crisp up, simply season with salt and skip the extra seasoning. Heat a large oven-safe metal or cast iron skillet over medium heat. Once hot, add the oil and the seasoned tofu. Sauté for 5 minutes, shaking/flipping occasionally to cook on all sides, until tofu has a slight crust on each side and has begun to brown. Transfer skillet to oven to bake for about 15 minutes, or until the tofu is firm to the touch and has begun to dry out and crisp up. The longer it bakes, the firmer it gets. I found the 15-minute mark to be about right. Now you have crispy tofu to add to virtually any dish you'd like! While the tofu is crispy and slightly seasoned, it does still benefit from a sauce, such as Peanut Sauce, my Almond Butter Glaze, a Curry Sauce, or my Garlic Dill Sauce. Best when fresh, but can be stored in the refrigerator up to 3 days. Reheat in a 375 degree F (190 C) oven until very hot. *Nutrition information is a rough estimate calculated with salt and without extra sauce/seasonings. *Method adapted from my Make Tofu Taste Good recipe. Turned out great! I used a heavy cast iron skillet and kept it on the towel-wrapped tofu for about 15 minutes. I cut the tofu into small cubes, fried in avocado oil for about five minutes (some definitely stuck to the pan), then transferred to the oven. I put it on a baking sheet and baked it at 400 for about 25 minutes then bumped it up to 425 for about five additional minutes. I kept checking to see if it was drying out and crisping up. Turned out great with this modifications. Every time I try to make this my tofu comes out with a bit of a rubbery texture… Do you have any tips for me as to how to avoid this? It could be the brand of tofu or it could be overcooked. We typically use Wildwood or Whole Foods brands. I’m new at cooking with tofu this makes it easy to do and understanding to getting started. Whoa!! This was my very first time making tofu anything and I am beyond impressed with the results. I tried a tofu meal for the first time a few weeks ago and have noticed various textures and definitely prefer a firm, crispy exterior texture and minimal moisture on the inside (certainly not completely dried out, lol). Anyway, this turned out perfect. I made general tso tofu with peppers, onions, and brown rice. My flavor came from the sauce, so I only added salt to the tofu after the initial baking step. I’ll definitly be making this again. By chance, the package I bought was an organic “extra firm” variety at Trader Joe’s. Thanks so much for posting this. I followed the recipe exactly and I’m beyond pleased with the results. XO. I will try this recipe soon because I so far have been so frustrated with tofu. One tip though, I buy extra firm pre-cubed tofu. It saves a step. Will just tossing in pan really let it crisp up? I have been using tongs and turning each one which is agonizingly long. Yay! Glad it was helpful, Meredith! You can, but when you reheat it it can change the texture of the tofu. It can get a little dried out and stringy. Why can’t you freeze the excess after you crisp it in the oven? I was really scared to make Tofu. Me and my family recently went plant based. Saw this recipe and gave it a try and we LOVED it. It tasted just like the one we get from a local place here in Utah. I’ve already made it twice this way and my boyfriend made me double the recipe this second time because he loves it so much. Even my 13 year old loves it. Looks awesome. I’m going try this with some super firm tofu i just bought for the first time. I usually use a light coating of cornstarch for crispy exterior. How were you able to get the tofu crispy? I’ve tried this two separate times and had no luck getting it to be crispy? Sorry to hear you’re having some trouble with this recipe, Jamie! Have you scanned through the comments above for tips? This recipe is really great. It took a lot time for me to figure out how to make tofu crispy. I really like how it is a healthy, crispy version of tofu too. Most crispy tofu is deep fried, so it is really nice to see you figured out a way to make it healthier. Thank you so much! Btw many of your other recipes are really delicious! Thanks for sharing them. You are really good at what you do. I want to make this to have with your risotto recipe. What seasonings do you suggest I add? Or should I just use one of the ones you suggested and make my dinner more internationally diverse? Hmm, you could go for like garlic powder, dried herbs, paprika, and cayenne? And even nutritional yeast! I am having a hard time with this. How long do you have the pan on top of the tofu? I suspect that’s my issue but the instructions aren’t terribly specific about how long to do this. Since the entire thing is supposed to take just 30 minutes, I guessed 10 minutes for the pressing part but my tofu is still wet (even after changing the towels). I used extra firm and all that. It’s not browning. It’s just a big mess. Hi Diana! 10 minutes should have done the trick as we recommended 5 minutes in the directions. Perhaps your pan was not heavy enough? This is perfect and crispy. I used to use the frozen method but not only do you have to plan better, like the night or day before, the final product lacks a freshness , most likely do to the freezing and as with all foods, fresh is always better. So this marks the spot. I get rave reviews when I serve it this way. Thank you, Dana. Your recipes are absolutely delicious and simple. Genius!!! Really delicious and easy to make! Thank you so much for sharing it! My husband and I both enjoyed it on top of our homemade, gluten free, dairy free pizza! It was a great addition. Im not a tofu fan but i want to be! question–when you say this is crispy, do you mean just crispy on the outside? is it still spongy on the inside? love your blog and exertise..so many of your recipes are on regular roation at our house. thanks so much!! Thank you so much! I have been looking for a way to make crispy tofu for so long and here it is, perfect recipe :) thank you! Fantastic. I made my own spice mix (curry, turmeric, and garam masala) and I used garlic salt instead of sea salt. The great part about doing this on the stove first is that the spices all get cooked and the aroma is amazing. I used this to go in a curry broth with peppers, onions, carrots, and rice noodles. It added a great texture. 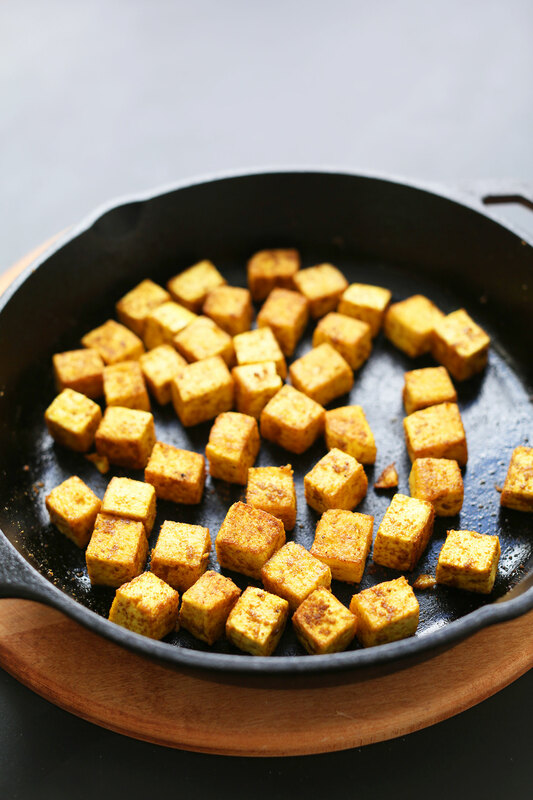 This will be my go-to crispy tofu recipe for the future. Do you ever use an air fryer for tofu? I love crispy tofu. In the past, I have dried, baked, then seasoned and browned in the cast iron skillet. Results were so-so. I can’t wait to try your recipe. Makes sense. Thanks. I have tried and failed at making tofu so many times, but since I’ve had great results with a number of your recipes, I thought I’d give it one last go. Boy, am I glad I did! This recipe is getting pinned to my favorites board! Tofu turned out crispy, firm and delicious. I’m excited to try it with other seasonings and in different dishes. Hopefully you’ll post more recipes featuring this ingredient. I made this recipe with my own adjustments of course. I used toasted sesame oil, nutritional yeast, soy sauce and red chili flakes. This is the tastiest tofu recipe I have ever made and is just the right crispy outside and soft inside! I love it, thank you! Love this. Works every time. I’m newly vegan without stopping in vegetarian land so I had never cooked or eaten tofu. Tried your recipe tonight and WOW!! So crispy and delicious! Thank you, this will definitely become a staple! This was delish! The first time ever that I cooked it well. Will be doing again for sure. Extra-firm tofu is sometimes hard to find in my usual grocery stores. Took a chance and used firm tofu. Placed it for an hour in my TofuXpress, then proceeded with recipe as written. Tofu turned out very crispy! Making the Almond Butter Tofu Stirfry with it tonight! My sister and I used this for the first time in the Cashew Soba Noodle Salad (from the cookbook) because we were unable to get edamame. It was fabulous! The first time either of us have LIKED tofu! My never-fail reference guide to making perfectly textured tofu. Crisping up in a cast-iron skillet before transferring to the oven – I went with 425F, personally – proves magical. Thank you! I made this recipe using sriracha for a stir fry, and it is by far the best tofu I’ve ever eaten at home. Even my husband ate it; he usually complains about the texture, but not this time! Thanks for an easy solution to mushy tofu. I loved the idea of sautéing AND baking the tofu! I ended up having to do both for a lot longer than the time recommended, but when the tofu was finally crispy, it was wonderful! I had this with broccoli and rice, topped with stir fry sauce and green onions. My whole family loved it. Hi Daniela! 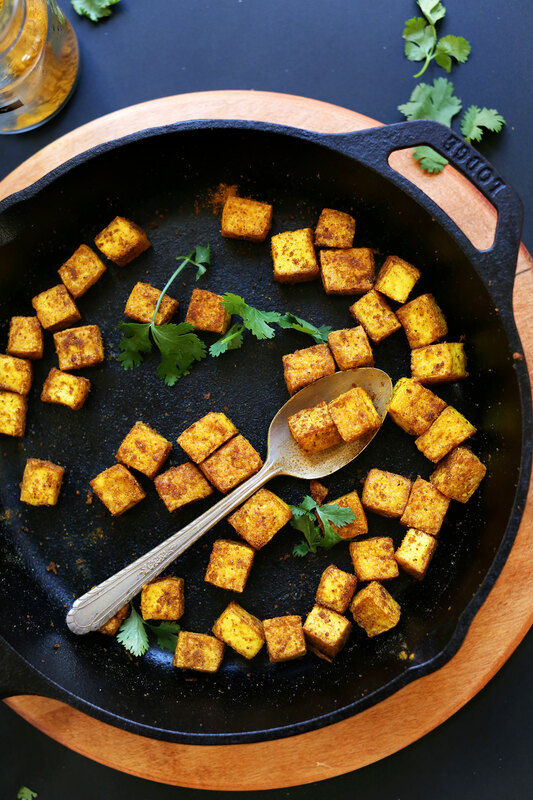 Ensure that you’re using coconut, avocado or grapeseed oil in your pan so that your tofu doesn’t stick! OOps. Sorry. Guess I should have read the last line on how long it will keep in the fridge. :-? I will not be able to eat all this in one sitting. After cooking, how long approximately will this last in the fridge? Hi June! While its best when fresh, it can be stored in the refrigerator up to 3 days. I made these using tamari and served with stir fried veggies. Thank you for sharing as they were delicious. I will definately make them again and try other seasonings too. Tried this tonight and it worked a treat. Thanks! I’m new to plant-based living and was pleasantly surprised to find I don’t dislike tofu. This recipe grabbed my attention right away (upon subscribing and stalking you on all forms of social media.?) and I gave this a try tonight. I think mine came out too oily. Any suggestions? Or is that just the nature of the beast if I want a crispy texture..? I used a avocado/saffron/coconut mixed oil that handled the heat very well and the pieces sizzled when laid in the pan and my oven was hot. Just wondered if I could do something better next time. Thanks! Love your recipes! I’m a very new vegetarian and I found myself desperately craving steak. I heard tofu could have the same texture and decided to give it a whirl. I found you recipe and instantly thought about using carne asada seasoning as if I was making a steak and I was blown away. It’s delicious!! Just enough of a crunch that it feels meaty without the guilt and tastes way better. Thank you for sharing this. I am now a tofu fan for life! 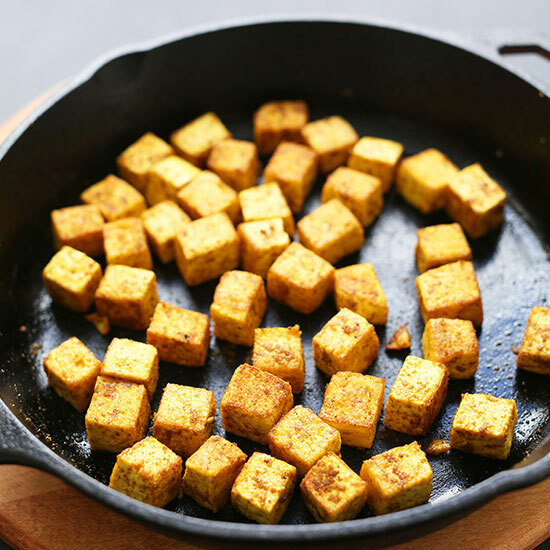 This has become my absolute favorite way to cook tofu! It turns out so crispy and delicious, and it’s extremely versatile. Thank you for this! Wow!! A nearly guilt-free way to enjoy Korean Tofu that I haven’t made much because it is usually deep-fried – and much less hassle! Still has a touch of oil absorbed which is part of the flavor of the dish. I love tofu and order it whenever I see it on a menu. I made your tofu recipe and it was fantastic. Thank you for sharing all of your healthy and delicious ideas. 2. Do you have a tsukemono press? I used to work in a Japanese restaurant and the head sushi chef used it to make tsukemono (Japanese pickles). It is also SPLENDID for tofu. I toss a block in before work and when I get home I slice and cook it and my tofu gets extra super crispy. Combined with your method it is the best thing ever! I make mine like this, but I use a seasoning that is advertised as salmon seasoning. It’s really delicious! I have trouble EVER getting tofu crispy. I tried this recipe two weeks ago, but it was spongy as any “crispy” recipes I try. I gave it another shot tonight using the tofu drying method described in Angela Liddon’s book, Oh She Glows Every Day. You cut the drained tofu into planks before pressing instead of pressing the block whole. I let it sit for probably an hour (overkill, maybe, but I wanted crispy!) – it worked GREAT! If yours isn’t crisping, there’s probably still to much water in the tofu. I was avoiding tofu for very long time. But recently I decided to give it a go. Then I googled some recipes and you came up. I tried this and now eat tofu every night! My favourite is tamarind, ginger and garlic sauce with maple syrup and little sugar… OK, excuse me, I must go and cook! Its really amazing!!!! So Good in taste who does not like raw tofu try this tofu recipe.Easy to make and No so much ingredients are used.Everyone can try to make it. I loved its taste. This came out really great. I cut my tofu much smaller than you did and my tofu got a little drier than I intended, but threw it into a sauce and it was amazing! I might make another seasoned batch and dry it a little more than I did this time for snack (like crunchy baked chickpeas with tofu instead) because I found myself munching on the smaller pieces. Really loved this method and it let me get the pan ready for your green coconut curry and the tofu was finished close to the same time as the sauce. i am wondering: what is the benefit of using both methods – frying and baking? i ‘m a bit reluctant to use both stovetop and oven if i could only use one. and also, 5 minutes pressing time sound very short to me. have you ever tried pressing longer (hours or even overnicght) and then just frying? that works fine for me, i would like to hear your opinion on just frying! I haven’t! But I have heard that pressing it longer makes it crispier, so that’s one option. I just like that it shaves off about 5-10 minutes AND the sauteeing provides a nice crust! But feel free to just do one or the other – baking probably preferred. I press my tofu for a minimum of two hours, and have pressed it overnight several times. I then cube it, and marinate it in a mixture of things like soy sauce, rice vinegar, and other seasonings for at least 20 minutes [I’ve also marinated it overnight, if I have more time]. I then bake it for 20-40 minutes [depending on how large I’ve cut the cubes], turning the cubes to crisp on each side. I prefer this method because I don’t have a fan in my kitchen, therefore pan-frying can get smelly and/or smoky; plus, it’s less hands-on. But I could see how the long pressing could make exclusive pan-frying work. As a Chinese woman, I love to eat toufu which contains lots of nutrition. This recipe here is really amazing. I will try it for my family. Just made it!! The crisp is there but it doesn’t tast much of the curry and smoked paprika I’ve put in for seasoning, any idea why??? Add more! Also, this tofu works best when then added to dishes with an additional sauce, like this curry! I’m in the UK and have searched high and low for extra firm tofu. I can only get the firm tofu – and that’s after going in every single Chinese food store in Chinatown! I press my tofu very firmly, and so far it seems to have been okay in the recipes I’ve tried. I want to try this recipe, but will only be able to use firm tofu. I’ll let you know how it goes. I like to microwave my tofu first to make it chewy! This looks awesome! Do you know if it would freeze okay afterwards? I would think so, yes! We stopped eating tofu (unfermented soy products inhibit absorption of minerals) and now stick to tempeh. Would you use the same method for tempeh? Hmm, not exactly. Tempeh is quite bitter. Start here + and I also have another recipe coming up soon that makes tempeh taste amazing! Since I started incubating our own tempeh I love it, where I didn’t like commercial stuff at all. I will definitely check out the link and wait for the recipe. Do you think vegetable broth would work instead of oil? Hmm, I don’t know about that. A little oil goes a long way and really makes the outside crisp up. Otherwise just leave it out. Throwing it in the oven after frying is brilliant! Next tofu block is getting the Dana treatment ;) ! Mmm I love tofu! Thanks for sharing an even easier way to prepare it. I pan fry tofu for when I have people over who might not be used to the taste/texture and it always works! I’ll bookmark this for next time. I had no idea tofu can be crispy! Can’t wait to try this one! Thanks! I was wondering if you have ever had the seasoned tofu at Cafe Yumm? It is soooo good. I’d love to figure out their recipe… can you take a guess? I haven’t but I’ve heard such good things! Will have to do some research. Bookmarked this page! I’ve been looking for a similar recipe for a long time. I want to bake it instead… do you think it’ll turn out crispy or is the sauteeing a must? The sauteeing quickens the process and gives it a nice crust. But I don’t think it’s necessary. My go-to prep with mine is soaking it for 15 minutes or so in salted boiling water (salted to where it’s like sea water salty), and then just towelling off the surface moisture before frying it in the cast iron skillet in very hot neutral-flavoured oil. Nice and crispy, yet truly seasoned from the inside out. I picked this tip up ages ago – would love to give credit but I can’t recall from where. That having been said, this recipe looks wonderful and will definitely give it a try this week! I am now ready to try making tofu again :) if I used another type of oil (sesame, peanut or sunflower seed), would the end result be affected in any way? If no, why do you suggest coconut/avocado/grape seed oils? Hi there! I like those oils because they’re neutral in flavor. But sesame peanut or sunflower would work, too! I can make crispy tofu in 5 minutes- you’ve got to try this- drain the water from your tofu and freeze it in ziplock when you bring it home from the store (we stock up when Costco has theirs on sale once a year). Throw on the counter to defrost the night before you need it. Once you are ready to use, wring out the liquid like a sponge and cut the tofu to the size you want. Then cook however you want (pan fry, baked nuggets, etc). I don’t know how people enjoy tofu without this awesome trick- makes the tofu nice and chewy and you don’t have to spend time pressing it out. yeah, thats a great way to prepare tofu! it’s actually a traditional chinese method, called “thousand layer tofu”. the texture changes a lot, it becomes like a sponge. that makes it especially great for soaking up marinades before frying. try it! I have done this for years also! Freezing it 1st always makes for yummy chewy crisp pieces! I have been vegan since I was 14 ands I have tried SO many diff ways! Just curious-what size cast iron skillet have you used in the last couple recipes and how do you clean it if used frequently? I’m asking because I usually scrub it (I do use soap to cut any oil residue), rinse it, put it back on a burner on low to dry it and then rub my hands with coconut oil and rub the pan while still warm…there must be an easier way. Thanks. Hi Shirleen! I never use soap. I only rinse it with water and loosen any food with a brush. Then I hand dry it and oil it occasionally. Hope that helps! It’s a 10-inch. Clean it with a layer of salt, when it is hot, all the stuck on stuff comes off and you don’t have to scrub at all. What does “wrap the tofu” mean? I am new to using it!! Thank you. 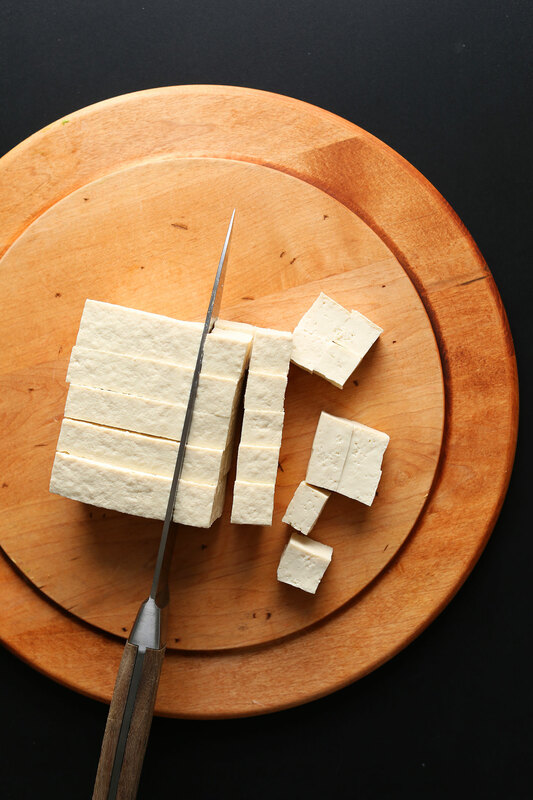 Tofu is packaged in a water solution, and if there’s any extra water in the tofu it will add to the length of time it takes to cook it to a crisp. Take the tofu out of the package and drain the liquid. 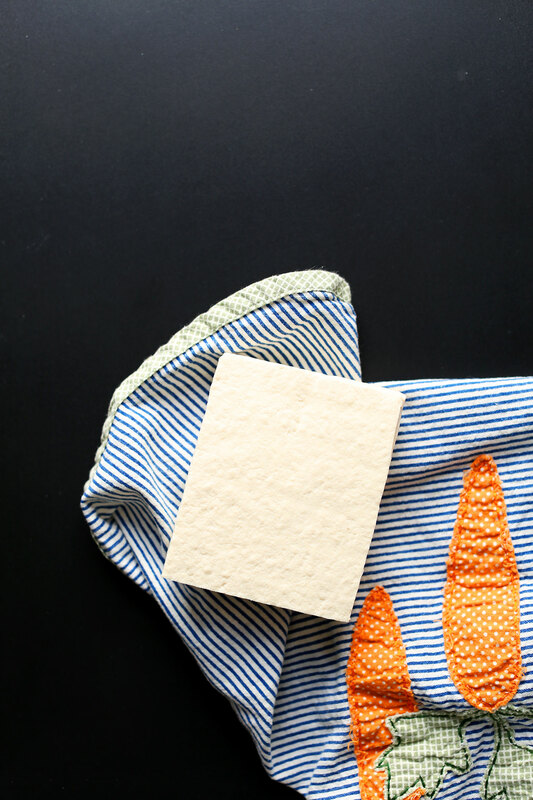 Then wrap the tofu block in a tea towel (clean of course) and place a heavy pan on top of it. The extra liquid will be squished out of the tofu by the heavy pan, absorbed by the towel, and the tofu will crisp much better, and faster! Simply wrapping it in a clean towel! wrap it in paper towels, or a clean, lint-free dish towel. you are wanting to press the extra water out of the tofu, the towel will absorb it. It’s super impressive that you managed to make tofu looks so scrumptious, that’s not particularly a gift I have! I’m trying to be more open with my food tastes and am exploring new options, especially dinner. SO bored of the same 5 dishes I make every night!! hehe. Can this be done a day in advance except for the final bake? Thanks for sharing this super awesome and easy recipe! It sounds yum!